Toddler Approved! : Camp Mom Session 1: Creepy Crawlies! Camp Mom Session 1: Creepy Crawlies! Over the next few weeks of summer I am going to be taking this great idea I found in Parenting Magazine and start a "Camp Mom" one to two days a week... maybe just one? We'll see. Hope you enjoy seeing some of things we do. Feel free to join us and start your own "Camp Mom" this summer. Earlier this week we went to a bug and spider class at a local wildlife museum... so we have been talking about little critters all week. Today's Camp Mom Session was devoted to our favorite topics of the week: bugs and spiders. Materials Needed: Scavenger hunt card (download it here) and a marker or crayon. I made up a little creepy crawlies scavenger hunt card, printed it out on cardstock, and we headed outside. My little guy carried around a marker and the scavenger hunt card (if you have a clipboard, use that too). I took turns carrying them too. He picked one object and we looked for it. Usually on our way we found a different thing, so we observed it and then crossed off the picture on our paper. If we decide to do this a lot, I will laminate the card and we'll use whiteboard markers. My little guy LOVED coloring on top of the bugs that he found. This was our favorite find of the day- a spider by the trash can! We did this activity until we got bored. If you do this with more than one kid, I would recommend cutting the board in half and looking for six things instead of twelve. My son was very motivated, so twelve was fine for us. Materials Needed: Graham crackers, frosting, red food coloring, paper plates, chocolate chips, M&Ms, plastic knife, spaghetti noodles (we would've used Twizzlers if we'd had them) and black decorator's frosting. 1. Mix the frosting with the red food coloring. 2. Cover the graham cracker with red frosting. 3. Outline the ladybug's body with black decorator's frosting. 5. Use chocolate chips for the spots. Count them together! and start eating!! This activity WILL be messy! I found several different websites with some coloring pages that I liked and we printed them off. Our favorites were from here and here. This was a nice break in between more involved activities. 1. We started off by reviewing our Insect version of "Head, shoulders, knees, and toes"- "Head Thorax Abdomen"... and making the three central body parts using different colors of playdough. The head was white, thorax was blue, and abdomen was green. 2. Next we stuck pipe cleaners into the insect to represent each of the six legs. We counted them as we went. 3. Then we stuck two smaller pieces of pipe cleaner in for antennae. 4. Lastly we stuck pom poms on the heads for eyes. We counted the eyes (2), counted the antennae (2), and counted the legs again (6)! 5. Finally we played with our little critters, named them (my son named mine, "Partner"), and then let them run around. Next time I would build the bug around a popsicle stick or pipe cleaner so that it would stay together. My son's kept breaking. Using model magic would be an even better idea... like we did with our "Love bugs" back in February. I definitely wouldn't recommend doing two treats in one day, but I liked both of the ideas I have shared and couldn't choose between them... so we did them both so that you can see some fun options to try. My son loves ice cream right now, so he thought this was really neat. 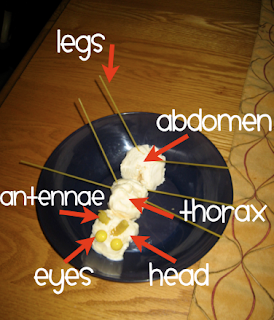 Materials Needed: ice cream, ice cream scooper, M&Ms, uncooked spiral pasta shells (antennae), and uncooked spaghetti noodles (legs). We would've used other candy/treat items for the legs and antennae, but our cupboards were bare... so we improvised so that we'd stick to goal #1 (use stuff around the house and save $$). My little guy didn't care and liked dipping the noodles in the ice cream :) I probably would've used Twizzlers for legs and long tootsie rolls for the antennae. 1. Spoon out three scoops of ice cream. Review your song and the names of each part as you scoop. 3. Count the legs and then add the M&M eyes and spiral noodle antennae. Count everything again! We reused the materials we already had from our scavenger hunt earlier in the day to do this activity. I printed off another scavenger hunt card and cut up the pictures. Then we reused our scavenger hunt card from earlier and just got a different color crayon to use. Materials Needed: 2 copies of scavenger hunt card (reuse and save paper! ), scissors, crayons, and tape. 2. Stick tape to the back of each picture and hide them all around your backyard (or inside your house). 4. Find a picture and then find the same picture on the Scavenger hunt card and cross it off! This helped us reinforce the vocabulary words we talked about and practice matching skills. Some of these were really hard for my little guy... and some (the ones he knew really well) were easy! Once all the pictures were crossed off, we were done!!... and then my little guy wanted to play again! Day 1 of Camp Mom was a success! Stay tuned for more fun next week! Love the idea of Mom Camp! I know my boys would enjoy the scavenger hunt and your card looks great. Thank you for your willingness to share your creative ideas! Can I get a copy of your scavenger cards and bug pictures? THese are great! Would love a copy of your scavenger cards and bug pictures as well. Thank you for posting.